When it comes to the expansion of federal power, Barack Obama is a once-in-a-generation President. According to data compiled by globalwarming.org, President Obama’s EPA has executed as many Clean Air Act regulatory takeovers of State programs than the previous three administrations combined, multiplied by 10. 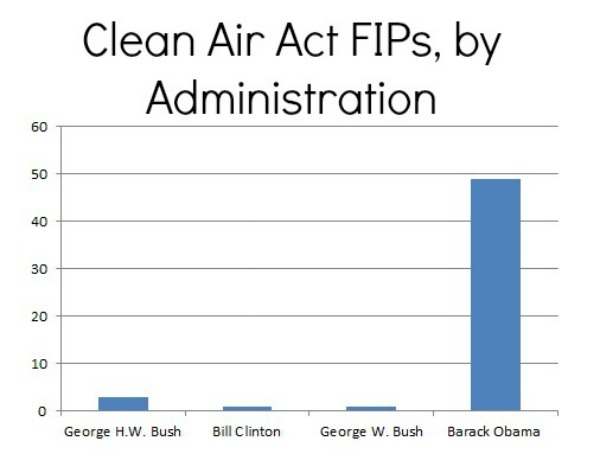 The charts below depict the number of Clean Air Act federal implementation plans imposed by EPA, broken down into presidential terms and also by year. * A federal implementation plan, or FIP, is the most extreme action the EPA can take against a State under the cooperative federalism scheme created by Congress. A FIP entails a complete EPA takeover from the state of the regulatory regime in question. With this in mind, the chart below speaks volumes about cooperative federalism as practiced in the Obama era. *This is an updated analysis of FIP totals from January. 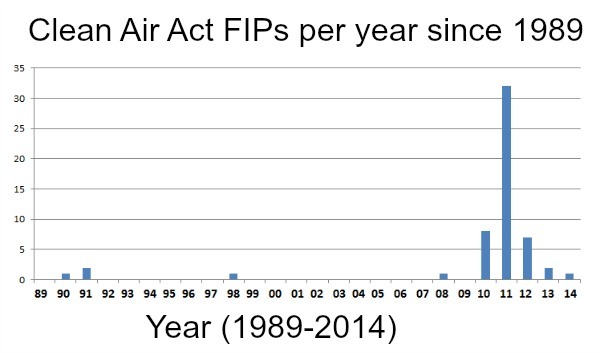 In a previous post, I’d identified the number of Clean Air Act FIPs through 1994. Thanks to a database upgrade, I was able to extend the analysis back to 1989.